A blissful, nurturing, reconnecting four-day retreat with live harp music, celebrating midwinter solstice together. A journey of light, remembering and insight, embracing the parts of us that need us most. The sounds of the harp interwoven with words and intention will take you on journeys within yourself, where you can safely explore. These harp journeys have lasting positive effects. Deep healing results from the merging of Soul and Body and the deeper insights this encourages. Upliftment and heightened frequency resonance occur naturally. Letting go of the old becomes effortless. During the retreat there will be harp meditations (in a warm room with a fireplace), intuition enhancing exercises (they are playful, fun and encourage your intuition to speak), reflection, creativity (you are invited to make your own wall hanging to take home with your journey reflected on it), sharing from our heart. Very nurturing and safe space to explore in. $444 for the whole retreat, including 3 nights accommodation and superb food. $422 for Wangapeka members. A non-refundable $100 deposit is required to secure your place. Please contact Annemieke for bank account details. Annemieke Harmonie (Bachelor of Education, Dip of Teaching, Dip of Shiatsu) was born and raised in Holland. She has learnt the harp since she was nine. From a young age she was asked to perform for people in rest homes, churches, in restaurants and schools. 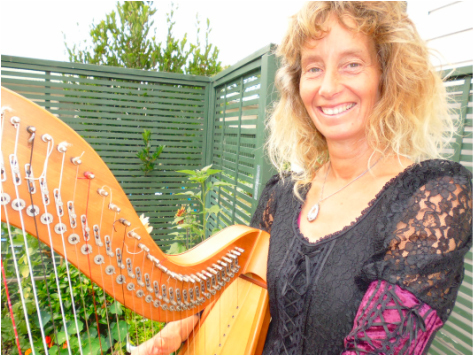 She graduated as a primary school teacher and then traveled the world with her backpack and her Celtic Harp. She visited many different cultures and was inspired by their customs and arts and music. It was a time full of learning, sharing and adventure. She performed world wide in castles, palaces, monasteries, museums, at wineries, on beach weddings, funerals, in churches, at festivals, for prime ministers, and recently for the governor general of NZ. Such beautiful awareness and openings of growth have unfolded for me since the workshop… Feel joy and gratitude for meeting you all and the open-hearted experience with you all… Om shanti! Thank you again so much for a wonderful weekend. It has created just the shift I needed to reconnect with my joy & to be present again. Such a lovely inspiring lot of people. I so value my intuition so to playfully explore that with other people was very revealing. Always love the opportunity to be creative. Your playing was exquisite , I am so pleased that I bought your CDs & can surround my self with your essence when meditating. My meditations have taken on a whole new depth. Blessings to you beautiful being!!! You touched my heart and inspired me! My faith in humanity is restored by the energy of our beautiful group and my being is rested and restored. Thank you so much for this past weekend. It was amazing to meet you and your girls. To me, your energy was powerful, kind, and felt so protective and embracing – and familiar as well – amazing and awesome! Feel deeply grateful for the experience with you all…special mention to you Annemieke for holding the sacred space for us to enter in…truly beautiful! Thank you so much to each of you; it was an amazing and nurturing day. It was also such a ‘confirmation’ that loving energy is so empowering and what the world needs more of. It has been such an enriching day for me to participate in the workshop that Annemieke held! Very soul nurturing to journey within together with fellow travellers …. Annemeke created a heartfelt safe group energy guiding us through meaningful processes and meditions and holding us all in her warm and loving embrace . Her harp playing was exquisite!!!! thank you Annemieke from the bottom of my heart. I had no expectations or thoughts on what the day was going to bring but was lured in my the harp and its magic. The energy built with its sound and it opened our hearts to whatever needed to happen for each person. Annemieke guided us with her words of wisdom and love. For me there was a beautiful mix of surprises with deep recognition. I enjoyed very much the mixture of going on my own journey and sharing with the other members of the group. The size was perfect for keeping that balance and making time for everyone.